Cihtli Ocampo "La Gallardí" dances to Miguel "El Funi"'s cante. I am so very excited to share this with all of you! The Flamenco Foundation of Houston is hosting the second annual Houston Flamenco Festival at the end of April and the visiting artist line up has just been announced. This year Houston will welcome Ethan Margolis and Cihtli Ocampo of Cuadro Flamenco Arte y Pureza. 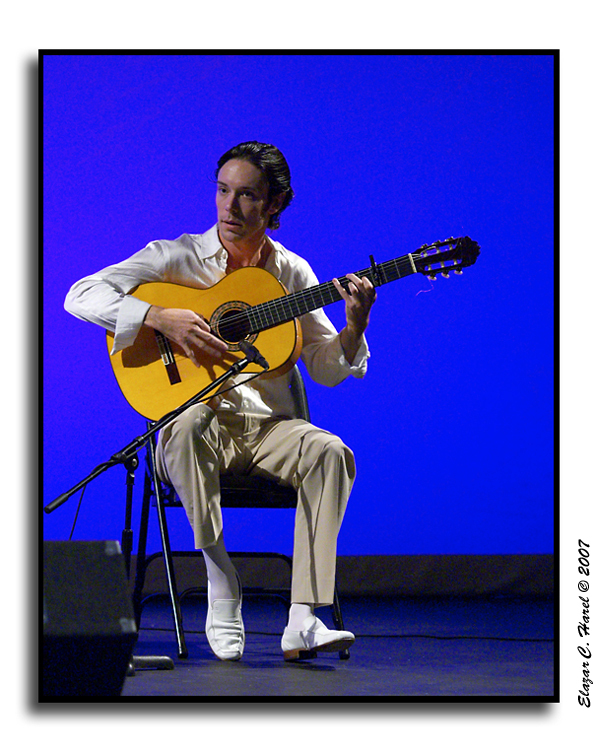 Decades long residents of Andalucia (Sevilla and Lebrija to be precise), guitarist Ethan and dancer Cihtli have trained and toured with some of the brightest names and clans of the flamenco world, including the Farruco family, Concha Vargas, "La Macanita", Antonio Moya, Miguel "El Funi", "La Tana", "El Lebrijano", Ines Bacan, the list goes on...Cihtli "La Gallardí" has also been featured in the film "Exils" by Tony Gatliff, and more recently (along with husband Ethan "Ezan Miguel") on the documentary "Spanish Day" by Jeff Katz. If you are a flamenco aficionado by now you should be extremely impressed. Ethan and Cihtli currently divide their time between their house in Lebrija and their studio in California, from which they are able to tour the United States, and we are so fortunate to have them visit us. Accompanying Cihtli and Ethan in this visit is the profound singing of Juan Bacán, brother of renowned singer Inés Bacán of the Pinini gypsy clan, central to the history of flamenco. Mr. Bacán was born in the Andalucian town of Lebrija, Spain, right in the heart of a gypsy flamenco community where flamenco is a way of expressing feelings and emotions, and where people sing and dance at any opportunity, over the household chores, at the corner bar, at a birthday, a wedding, or even a wake. Juan Bacán was inmersed in his family's flamenco tradition from a very early age as the older members of his large clan passed on the secret of their art to the younger generations, who in turn would add their own identity to their inherited cultural legacy. Juan Bacán's voice is enriched with the haunting echo of his aunt, the legendary Fernanda de Utrera and with influences from his cousins Miguel "El Funi" and Juan "el Lebrijano". Arte y Pureza will conduct workshops on two different flamenco rhythms, the deep and soul wrenching Soleá, and the festive Bulería, and they will perform along with Juan Bacán on Sunday, Aprill 22nd, in what promises to be an evening of sublimely spontaneous and authentic Flamenco. The Julia Ideson Building of the Houston Public Library. Houston, Texas. It is said that Julia Ideson's (1880-1945; pioneer librarian, activist, suffragist) primary request for the new Houston Public Library was that there be abundant light. Light is a common theme in library design, not only because of the pleasant environment it creates, but also because of the symbolism it carries: our passage from the darkness of ignorance into the illumination of knowledge. After my recent tour of the newly renovated library (guided by Ms. Barbara Humphreys) I would have to conclude that Julia got her wish of creating a distinguished center for learning where light, symbolic and real, floods every space in the building. The entrance vestibule at the Julia Ideson Library. Houston, Texas. The entrance hall of the Julia Ideson Library. Houston, Texas. When it opened in 1926, the library replaced the earlier Carnegie Library. The building was designed by Boston architect Ralph Adams Cram of Cram and Ferguson, and was greatly inspired by the Renaissance facade of the Universidad de Alcalá in Spain. The Julia Ideson Library. Houston, Texas. The Spanish influence permeates the building, from the limestone decorations of the facade, to the iron cases that display precious books inside. The ornate cornice of the Julia Ideson Library. Houston, Texas. A century old camera stands next to a photo amplifier. Architectural drawings in the Architecture Archives of the Julia Ideson Library. Houston, Texas. A shelf in the Architecture Archives of the Julia Ideson Library. Houston, Texas. A 16th century Spanish prayer book from the rare book collection. The Children's Reading Room of the Julia Ideson Library. Houston, Texas. A book display table in the Children's Reading Room. We climb the grand staircase and find ourselves outside a richly decorated space now called the Tudor Gallery, (in honor of Houston Historic Preservation advocate Phoebe Tudor) which in Julia's day served as the library's circulation desk. The walls of the gallery are decorated with four murals painted by Houston artist Emma Richardson Cherry and depicting buildings of importance to Texas history. The grand staircase of the Julia Ideson Library. Houston, Texas. The Tudor Gallery of the Julia Ideson Library. Houston, Texas. The coffered ceiling of the Tudor Gallery. The Tudor Gallery seen from the balcony of the Architecture Archives. The Tudor Gallery leads into the library's main reading room, and it is here that Julia's vision of light is fulfilled. The room is punctured by great arched windows on three of its walls, and the brilliance is such that, even on a rainy spring day, the artificial illumination of the chandeliers is superfluous. The Reading Room of the Julia Ideson Library. Houston, Texas. A beautifully carved wood screen separates a smaller reading room from the main hall, and in it I encounter a young man who is so focused on his study that he does not look up from his pile of books at the persistent click of my camera or the echoing tap of my shoes. The smaller reading room on the North wall. The glazed loggia of the Main Reading Room. Glazed loggia at the Julia Ideson Library. Houston, Texas. The court of the Julia Ideson Library. Houston, Texas. Many thanks to Yvonne Meyer for inviting me to tour the library, and to Barbara Humphreys for the wonderful narrative. All images by Nadia Palacios Lauterbach. 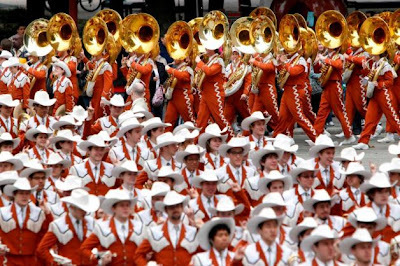 Houston Living: It's Rodeo time! Rodeo Trail Ride. February 24th, 2012. Image by Houston Chronicle. 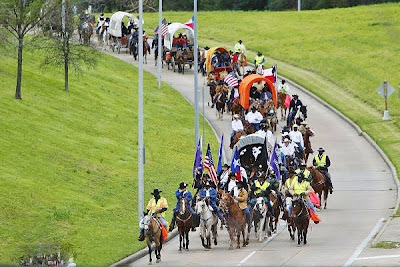 Whether you are a native Houstonian or a recent transplant, early spring is likely to be an exciting time: The Rodeo is in town! I love the Rodeo, it reminds me of the pageantry of the August Fair in Chinandega (my childhood hometown in Nicaragua), and like in Chinandega, it seems that the excitement of the Rodeo is a city-wide phenomenon. There is a beautiful provincialism about this time of year that makes me forget I live in modern sprawling city, so similar to many other American cities, and instead I feel that Houston is a distinct place, with its own culture and its own flavor. The Rodeo Parade. Image by Mayra Beltran. Houston Chronicle. Rodeo competitions. Image by the Houston Chronicle. Besides admiring the magnificent animals on display, every year brings something new to be discovered, like the time we visited on "Go Tejano" day and saw the beautiful and fearless amazons riding side saddle on their prancing horses, or like this year when we learned that Dr. Temple Grandin was to give a lecture! I know that the highlight of our evening should have been John Legend's concert (and it was great fun, don't get me wrong), but listening to Dr. Grandin recount her struggles with autism, and how she has applied her unique skills to the humane treatment of animals was a far more enjoyable experience. 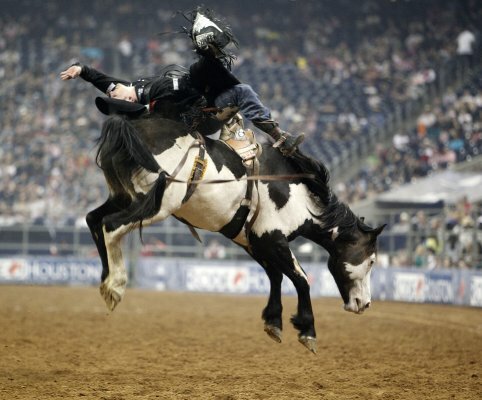 Dr. Temple Grandin speaks at the Houston Rodeo. Image by Nadia Palacios Lauterbach. Dr. Grandin, a professor of animal science at Colorado State University, described to us the inner workings of her brain (which she calls a visual brain), and how unlike most other people whose minds formulate concepts through vague ideas, Dr. Grandin carries in her mind a collection of concrete examples and specific images which she has seen or experienced throughout her life; this unique disposition allows her to categorize and solve problems, and understand the behavior of animals. Dr. Grandin explained that autistic brains tend to be specialist brains, and she classifies them into three groups, each with advantages and disadvantages: Photo realistic thinkers (like her) who tend to be poor at algebra, pattern thinkers who excel in math and music but may have trouble reading, and verbal thinkers who know every fact about everything but cannot draw. The visual autistic brain, Dr. Grandin says, sees thoughts and words like a Google Image slide show, picking out the details while the "normal" brain ignores the details. "If someone says the word factory, most people think of a vague place. I think in detail of every factory I ever saw, like the John Deere plant in Moline. Animals are sensory thinkers, thinking in pictures, smells, sounds. They don’t think in terms of language. I don’t either." Dr. Grandin's principal message is that the world needs different types of brains and children need a variety of stimuli to improve their learning; she advocates for a return to what she calls "hands on" classes, because language (the social aspect of our brain) obscures the visual thinking we share with animals: "to take art, drafting, music out of the schools is a critical mistake, as autistic kids need to have these programs to nurture their 'fixation'. These kids are really smart, and teachers need to know how to direct these kids." I couldn't agree more and I would venture to stay that all children, autistic or not, need art in their lives. 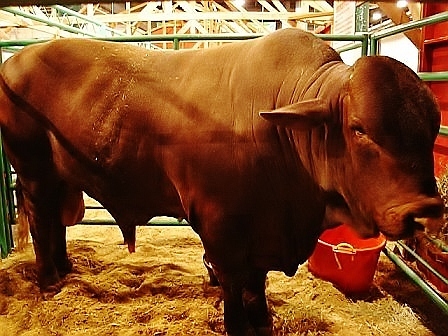 The Rodeo stays in Houston until March 18th. Image by Nadia Palacios Lauterbach.